English musician and composer; born at Canterbury, England, in 1792; died at Sydney, N. S. W., Jan. 15, 1864. He was intended for the ministry and studied under Professor Lyon at Cambridge, but, owing to his love of music, he was articled to Dominico Corri, the Italian composer. Nathan made his début at Covent Garden Theatre March 12, 1816, but his voice proved too weak for the stage. He then turned dramatic and musical composer, and became instructor in music to Princess Charlotte of Wales, as well as historian of music to George IV. Nathan went to Sydney in 1841, where he frequently lectured and where he rendered great service in developing musical talent and in improving Church music and choral societies. Nathan wrote a "History and Theory of Music" (1823); "Musurgia Vocalis" (1836); "Memoirs of Madame Malibran de Beriot" (1836); "The Southern Euphrosyne and Australian Miscellany" (1846). Among his other productions are: the music to "Sweethearts and Wives," 1823; "The Alcaid," 1824, opera; "The Illustrious Stranger," 1827, musical farce; and "The King's Fool," drama. His songs include: "Beauty's Bower"; "Come Kiss Me, Said Colin"; "Fair Haidée"; and "Lady-Bird." One of his more celebrated songs is "Why Are You Wandering Here, I Pray?" Nathan is also known as having set to music Byron's "Hebrew Melodies." Though lacking in Hebraic character, six of the "Melodies" were used in the synagogue; probably four of these were derived originally from non-Jewish sources. The remainder of the music is very poor; and it has deservedly sunk into oblivion, like other music composed by Nathan for Lord Byron's verses. John Braham had a very small share in the preparation of the "Melodies." He was at the height of his fame as a singer, and probably did nothing more than lend his name to the venture. The volume is dedicated to the short-lived Princess Charlotte of Wales, to whom Nathan had given singing-lessons; and the original compositions, numbering half of Part I. and all of Part II., are in his meretricious style. 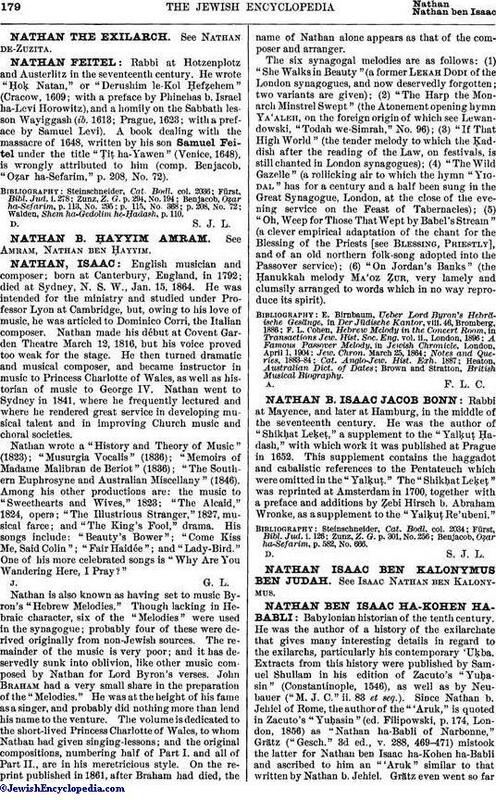 On the reprint published in 1861, after Braham had died, the name of Nathan alone appears as that of the composer and arranger. The six synagogal melodies are as follows: (1) "She Walks in Beauty" (a former Lekah Dodi of the London synagogues, and now deservedly forgotten; two variants are given); (2) "The Harp the Monarch Minstrel Swept" (the Atonement opening hymn Ya'aleh, on the foreign origin of which see Lewandowski, "Todah we-Simrah," No. 96); (3) "If That High World" (the tender melody to which the Ḳaddish after the reading of the Law, on festivals, is still chanted in London synagogues); (4) "The Wild Gazelle" (a rollicking air to which the hymn "Yigdal" has for a century and a half been sung in the Great Synagogue, London, at the close of the evening service on the Feast of Tabernacles); (5) "Oh, Weep for Those That Wept by Babel's Stream" (a clever empirical adaptation of the chant for the Blessing of the Priests [see Blessing, Priestly], and of an old northern folk-song adopted into the Passover service); (6) "On Jordan's Banks" (the Ḥanukkah melody Ma'oz Ẓur, very lamely and clumsily arranged to words which in no way reproduce its spirit). Brown and Stratton, British Musical Biography.